Following last Saturday’s celebration named ‘The Return to Wembley’ at Camp Nou and the tribute that was paid to those involved in the first ever victory in the European Cup, events to commemorate the 25 years since the Wembley win come to an end. Since the start of the 2016/17 season, the Club has produced various events to commemorate the importance of that historic evening at Wembley. The shirt used during the 2016/17 campaign was inspired by the design of the shirt from the 1991/92 season, a tribute to that first European Cup winning side. At the start of the events to commemorate 25 years since the Wembley win, the Club invited Italian side Sampdoria to be Barça’s opponents in the 2016 Joan Gamper Trophy game, the same team the blaugranes defeated in that memorable final. The design of the card for the season 2017 also paid tribute to Wembley 92 with a vintage look based the team’s shirt from that season , the one that the Dream Team wore in the famous final. With the campaign Share your memories, the Club reached out to members, supporters’ clubs and fans to share photographs and other audiovisual material from that final. Members and fans who saw that final sent different types of material to the Club, some of which was visible on the Club’s website and the Espai Wembley exhibition at the Museum. 29 March saw the opening of the ‘Espai Wembley’ at the Barça Museum, an exhibition that allows visitors to look back at the European Cup win via photos, videos and artefacts from the final against Sampdoria. The ‘Espai Wembley’ will be open until 30 September. The contribution made by those who experienced that final can be seen on various screens that bring together the material sent to the Club by members, fans and supporters’ clubs. The Club also launched the digital campaign #Wembley25 via its own social media channels to publicise the European Cup win amongst younger fans and the events that were taking place to commemorate the 25th anniversary. Barça TV dedicated special programming to remember the European Cup win. Opinions and contributions were gathered from those involved in that final with special documentaries dedicated to the players and other who were involved in the famous match. 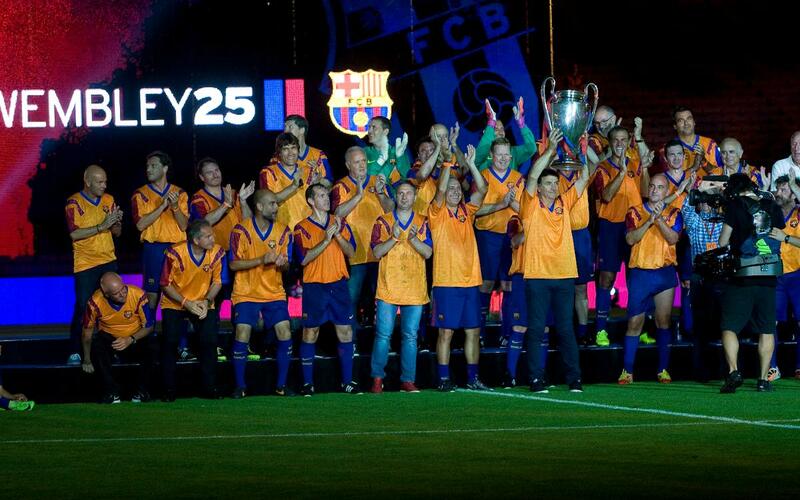 Barça TV also broadcast live the special events that took place as part of the Wembley 25 celebrations. ‘Minute 111’ was a game show put together for supporters’ club members by Barça TV with questions based on the Club’s history; different clubs competed against each other with the name of the programme a reference to the point in the game against Sampdoria in which Ronaldo Koeman’s scored his memorable winner. On Saturday 20 May in the 1899 Auditorium, on the day of the 25th anniversary itself, the institutional event to commemorate the final took place with president Josep Maria Bartomeu, vice president Jordi Cardoner, the commissioner for the Wembley25 events, former player José Mari Bakero, broadcaster Pitu Abril who commentated on the game in 1992 for TVE Catalunya. In the event, former president Josep Lluís Núñez was also present as was assistant coach in 1992 Carles Rexach amongst other guests,. The first team shirt in the last game of the league season at Camp Nou against Eibar on 21 May bore a special commemorative Wembley logo on the chest which read “#Wembley25 20 May 1992”. The 1899 Auditorium on 7,8,9 June hosted three colloquiums dedicated to remembering that European Cup victory and the influence of Johan Cruyff on that team and the Club’s history. The three talks were followed closely by the public present at a packed Auditorium. The first talk saw members of the press discuss events under the title ‘The year that changed our lives’, whilst the second saw coaches Javier Clemente, Vicente del Bosque and John Toshack take part under the title ‘Johan’s legacy.’ The final talk was named ‘Wembley experiences’ with former players Hristo Stoichkov, Ronald Koeman, Eusebio Sacristán, Guillermo Amor taking part as well as former player and coach Carles Rexach. Players, coaches, directors and staff members from the season of the first European Cup came together for a tribute dinner at Camp Nou together with their families. Before the dinner, at the doors of the stand a new commemorative plaque was unveiled to remember the event and it will be placed in the foyer of the main stand at Camp Nou. The commemorative events for the 25th anniversary came to an end at Camp Nou with the Return to Wembley show in which tribute was paid to the Wembley heroes in an event in which the very same players and their families took part. There was an informal match between the players and former players from Benfica as well as an emotional audiovisual element to bring to an end the celebrations in memory of Wembley 25.